Rock Princess Butterfly! - Episode~73 & WINNER! CHA CHA CHA!! Here are the PICTURES!! Good Morning my Creative Friends! I am just LOVING this week's challenge! I am SOOOO SUPER THRILLED about using my Tinkerbell cart! Which, by the way, I've ONLY used "Once" before! Sad, HUH?? For this week's challenge, it is sponsored by Cri-Kits.com! 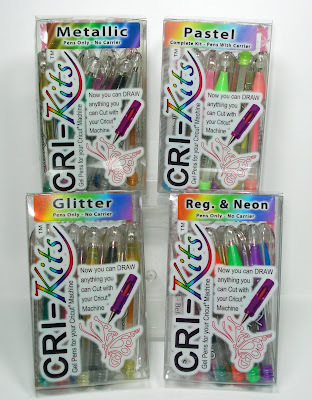 Starting today & running for the next 14 days, Cri-kits is offering a special! If you place ANY order between now & then, You can enter in a special code: ADDITON then you will recieve 3 pens for FREE w/any order! You will receive the Black one, a Metallic Gold and a Glitter Silver pen! You can place your order HERE! Isn't that a WONDERFUL offer?? Well, I hope you enjoyed my card this week! OH, did I forget to mention this week's AWESOME giveaway?? YEP, you guessed it! 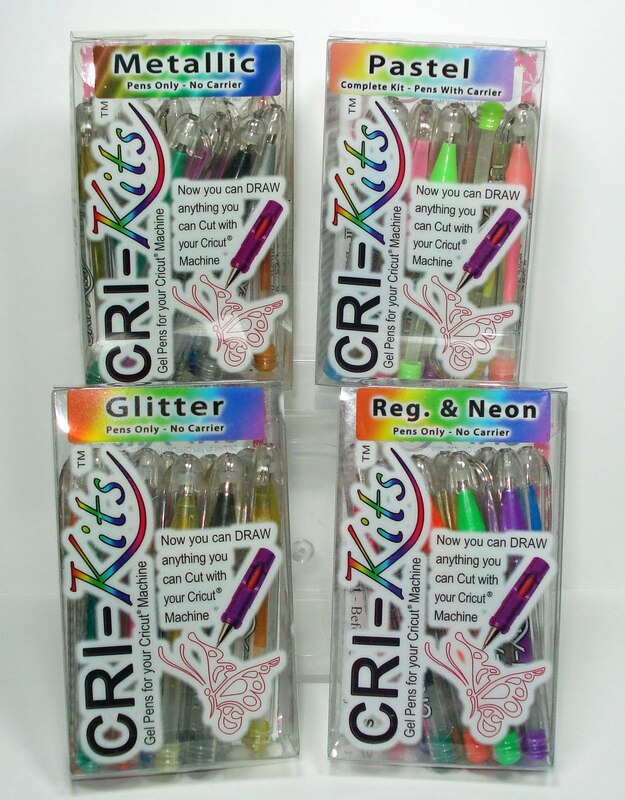 ONE LUCKY winner will be able to choose ONE Box of the Crikit gel pens color of your choice! I feel sorry for the lucky person who has to choose because I LOVE ALL THE COLORS! WOW, instead of being last this time I am first. What a great give away... Have a wonderful weekend. This was a perfect Throwback, as I needed to make a little girl card this morning! Those colors are fun!!! Your card was so fun! Thanks for sharing you r inspiration. I love blogs because they jump start my creativity! Love the Cri-Kits. I've been eyeing the embosser as well. I like how it gives you 2 different embossing tips instead of just 1. Love your card! Beautiful! Such inspiration. Wow Emma this is amazing! I think its my favorite card you've ever done. The colors are great! Super awesome I may have to get some of those pens hummm. Super cute! I love these markers! It's great for detailed cuts that you like. I need to get caught up from all the spending from school and then must buy dvd, markers, and paper!! So cute, Silver Mist is my fav princess too:) I never knew how these pens worked, I am going to have to try them! These pens give a whole new dimension to using our Cricuts...fun. Your Princess is so pretty. WOW EMMA! I thought you had stamped the card and colored it when I first saw it. Those little gel pens worked great. This Silver Mist card is the cutest! And I love the little flowers - CUTE!!! Wow Emma I can't believe how will that draw that. Now I want them to. Love your card. How you doing Emma. I can't wait for the week of Sept 6th to start. Cool challenge!!! I gotta get me some of those, well of course if I don't win them first. I was thinking of ordering the cricut markers just so I can do this...but I think I'm sold on the gel pens. I love the outcome! What a GREAT give-a-way. I have wanted to try these pens since the first time I saw them. I LOVE the way your card turned out. I think I NEED to try the Cri-ket pens for all of my Disney carts. It might save my sanity. 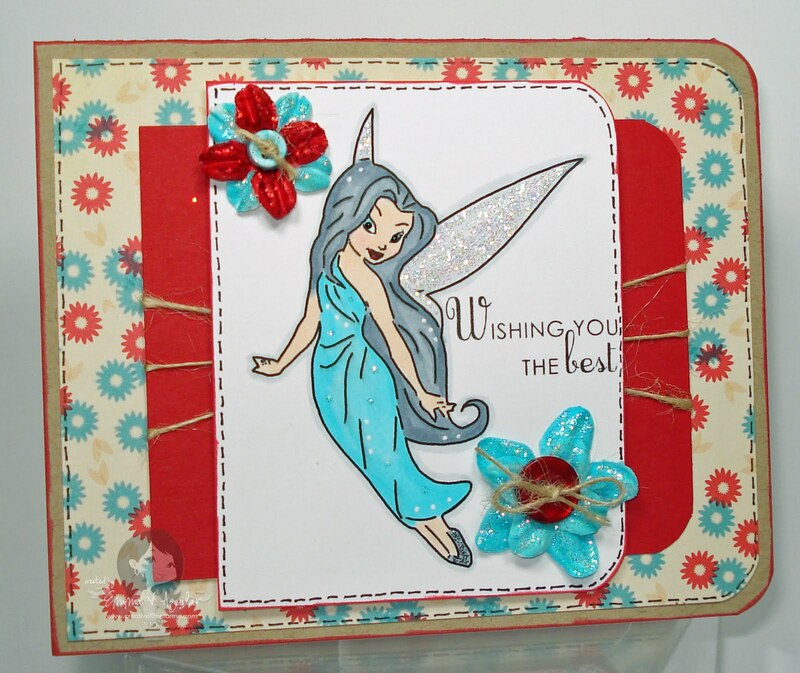 :) Your card turned out fantastic! How adorable! I really need to get this cart. TFS! WOW!! What a beautiful card!! !Love all the sparkle! Emma- what perfect timing for this challenge as I already had my project in my head and just needed to sit down and get it done - thanks for "making" me get it done - lol! i had a lot of fun participating in this challenge. Thanks Emma keep it up. hope you like my card. even if i dont win i might go ahead and order some of those pens..i was trying to "copy" your idea and it definitely didnt work with the markers lol. I really like Throwback Thursday Challenges. It allows me to use cartridges that I have not used in a while or for the first time. Hi Cori, I will be doing a few other projects with the markers! Be on the look out for more Cri-kit gel pen videos! Thanks for the great demonstration on the Crik-it pens. Your princess is adorable!!! Thanks for this great challenge! I finally used my Tinkerbell Cartridge! Very cute card! Tinkerbell is so cute but sassy! Love it and all the copic coloring! I hope you do some tutorials on the pens because I would love to see before I buy them. I used Dreams Come True cart for my princess challenge card. This is the first time I used this cart so thanks for the challenge again Emma! Emma my lovely friend, this is my very favourite of all your fabulous projects. You are a SO talented Sweety. (See you at the blog hop)!! The card is just beautiful! I look forward to all your videos. Thanks for showing me how the Cri-kits pens work. I love your blog and love using the gypsy! 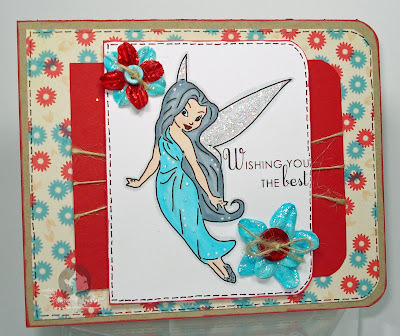 Wow Emma the colouring and the flowers and the twine make this card amazing. Your card is amazing and those pens are fab. I have been debating about buying them for so long. I should just go ahead and buy a set! You have convinced me my friend. Great card!! I entered the challenge for the first time!! Love you tutorials! What a beautiful, beautiful card, Emma !!! Hugs, Martha C.
Hey Emma, it's been awhile since I've watched one of your video's!!! I love this card! I love all the things you demo'd. Awesome (and tough) challenge! I have the Tinkerbell cart, but haven't had much chance to play with it, so we used yours as inspiration. LOL! My boys had so much fun helping me with this one! Ok so I was tired of only being able to look and not take part so I enlisted the help a good friend(Hey Gloria) and together we created the beginnings of our blogs! So glad to be a part of this now Emma! VERY VERY CUTE Fairy EMMA love it!!! Hi Emma, Thanks for the chance to enter your challenge. I enjoy checking out your creations - and I love your fairy - she's adorable. Hi Emma, the Throwback Thursday Challaenge was so fun.I love all of your creations and love the fairy shes soooooooo cute. Thanks for another fun challenge. I didnt have tinkerbell cartridge, but I still was able to do a real sweet pricess layout. Love your blog and all your great ideas. Thanks for a chance to win. Emma, this challenge was the MOST fun!! Tinkerbell is my absolute favorite princess of all time. She is so sassy! I loved doing this card, of course, I have enjoyed doing all of your challenges! Thanks for all the inspiration! Hello my "Gypsy Diva" love your challenges and the prizes of course...LOL I had a little Peachy Keen withdrawals when you showed what the prize this was time....LOL But I have to admit those are some nice little plumas :) Thanks for all your inspiration and hard work. Hey Emma, I had fun doing this challenge! I made a video but it keeps coming up with the bottom 1/2 blue. I know I need to format or do something to the video before I dump it into Movie Maker but I can't remember for the life within me what that was! LOL so video will be up sometime next week when my dh is home. Had fun. Love your blog. Your fairy is sooo cute!! Love these pens I only have 3 that I got from CHA. But they draw so smoothly. Thanks for the chance to win Emma! Wheew! finally finished and entered! this weeks card was def. a challenge for me. Thank for hosting such fun challenges Emma! Thanks again for the challenges i havent entered one for awhile they are all so good. This was such a fun challenge. Thanks for letting us "Play"!!! Another great challenge Emma! Love this time of the week!!!! Your card was very pretty. I really had a lot of fun with this challenge. FEW!!! I made it! This was a tad more time consuming than I thought. But soooooo cute! Hope you like it!! I love your card! Those little pens are awesome it looks like you stamped her on there! Thanks for the great giveaway! Oh and thanks for visiting my blog, and being my first follower! bummer I missed out .. still a cute card though. I realized doing this challenge that I NEED to get some glimmermist ;) I also went and bought Once Upon a Princess cartridge after this seeing how I decided I NEEDED to have more girly stuff for my 2 girls scrapbooks! Hi Emma, thanks so much for giving me the opportunity to enter this challenge. I just want to say I love doing your challenges. However today I put the wrong link for your princesses challenge and put in the Peachy Keen challenge, so you will see that I entered back to back, if you could please remove my Peachy Keen entry I would appreciate it. I apologize for the inconvenience.